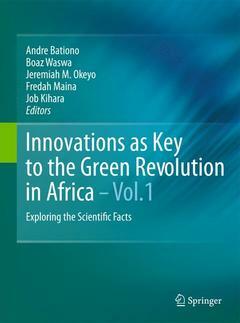 Africa remains the only continent that has not been able to fully benefit from the effects of the Green Revolution. Over the last 15 years the number of Africans living below the poverty line ($1/day) has increased by 50%, and it is estimated that almost 200 million people, over one third of the population, suffer from hunger. There are over 69 million small holder farmers in Sub-Saharan Africa who do not have access to effective and affordable inputs, appropriate technology and information, and functioning markets. To move out of this trap, Africa needs an agricultural innovation, which is the application of new and existing scientific and technological (S&T) knowledge to achieve the desired growth in agricultural production and overall economic development. African farmers need better technologies, more sustainable practices, and fertilizers to improve and sustain their crop productivity and to prevent further degradation of agricultural lands. The agricultural sector also needs to be supported by functional institutions and policies that will be able to respond to emerging challenges of globalization. The African Network for Soil Biology and Fertility (AfNet) organized an International Symposium on Innovations as Key to the Green Revolution in Africa: Exploring the Scientific Facts' in Arusha, Tanzania, 17-21 September 2007. The overall goal of this symposium was to bring together scientists, agricultural extension staff, NGOs and policy makers from all over Africa to explore the scientific facts and share knowledge and experiences on the role of innovation in soil fertility replenishment as a key to the Green Revolution in Africa. This book presents the outcome of the symposium and outlines the challenges and opportunities for improving agricultural growth in Africa. Soybean varieties, developed in lowland West Africa, retain their promiscuity and dual-purpose nature under highland conditions in Western Kenya; Long-term effect of continuous cropping of irrigated rice on soil and yield trends in the Sahel of West Africa; Conservation tillage, local organic resources and nitrogen fertilizer combinations affect maize productivity in Arid and Semi-Arid Lands in Kenya; Long-term land management effects on crop yields and soil properties in the sub-humid highlands of Kenya; Integrated management of fertilizers, weed and rice genotypes can improve rice productivity; Integrated soil fertility management for increased maize production in the degraded farmlands of the Guinea Savanna Zone of Ghana using devil-bean (Crotalaria retusa) and fertilizer nitrogen; Effect of organic inputs and mineral fertilizer on maize yield in a Ferrasol and a Nitisol soil in central Kenya; Effects of Conservation Tillage, Crop Residue and Cropping Systems on changes in Soil Organic Matter and Maize-Legume Production: A Case Study in Teso District; Benefits of integrated soil fertility and water management in semi-arid West Africa: an example study in Burkina Faso; Survival and Soil Nutrient Changes during Five Years Growth of Sixteen Faidherbia albida Provenances in Semi Arid Baringo District, Kenya; The “secret” behind the good performance of Tithonia Diversifolia on P availability as compared to other green manures; Biological nitrogen fixation potential by soybeans in two low-P soils of southern Cameroon; Roles for herbaceous and grain legumes, kraal manure and inorganic fertilizers for soil fertility management in eastern Uganda; The Effects Of Integration Of Organic And Inorganic Sources Of Nutrient On Maize Yield In Central Kenya; Forage Legume-Cereal Double Cropping in Bimodal Rainfall Highland Tropics: The Kenyan Case; Effects Of Conservation Tillage, Fertilizer Inputs And Cropping Systems On Soil Properties And Crop Yield In Western Kenya; Effect of manure application on soil nitrogen availability to intercropped sorghum and cowpea at three sites in eastern Kenya; The Effect Of Organic Based Nutrient Management Strategies On Soil Nutrient Availability And Maize Performance In Njoro, Kenya; Using forage legumes to improve soil fertility for enhanced grassland productivity of semi-arid rangelands of Kajiado District, Kenya; Potential of cowpea, pigeonpea and greengram to contribute nitrogen to maize in rotation on Ferralsol in Tanga – Tanzania; Model Validation through Long Term Promising Sustainable Maize/Pigeon Pea Residue Management in Malawi; Use of Tithonia biomass, Maize residues and Inoraganic phosphate on Climbing Bean yield and Soil properties in Rwanda; Potential of Increased Maize and Soybean Production in Uasin Gishu District, Kenya, Resulting from Soil Acidity Amendment using Minjingu Phosphate Rock and Agricultural Lime; Residual effects of contrasting organic residues on maize growth and phosphorus accumulation over four cropping cycles in savanna soils; Interactive effects of selected nutrient resources and tied-ridging on plant growth performance in a semi-arid smallholder farming environment in central Zimbabwe; In-Vitro selection of Soybean accessions for induction of germination of Striga hermonthica (Del.) Benth seeds and their effect on Striga hermonthica attachment on associated maize; Innovations In Cassava Production For Food Security And Forest Conservation In Western Côte D’Ivoire; Promoting uses of indigenous phosphate rock for soil fertility recapitalization in the Sahel: state of the knowledge on the review of the rock phosphates of Burkina Faso; Selecting indigenous P solubilizing bacteria for cowpea and millet improvement in nutrient deficient acidic soils of southern Cameroon; Evaluation of Human Urine as a Source of Nitrogen in the Co-Composting of Pine Bark and Lawn Clippings; Extractable Bray-1 Phosphorus and Crop Yields as influenced by Addition of Phosphatic Fertilizers of Various Solubilities integrated with manure in an Acid Soil; Seedbed Types and Integrated Nutrient Management Options for Cowpea Production in the Southern Rangelands of Semi-Arid Eastern Kenya; Land and Water Management Research and Development in Arid And Semi-Arid Lands Of Kenya; Evaluation of establishment, biomass productivity and quality of improved fallow species in a ferralic arenosol at coastal region in Kenya; Assessment of potato bacterial wilt disease status in North Rift Valley of Kenya: A Survey; Soil fertility variability in relation to the yields of maize and soybean under intensifying cropping systems in the tropical savannas of north-eastern Nigeria; An evaluation of Lucerne varieties suitable for different agro ecological zones in Kenya; Water Harvesting And Integrated Nutrient Management Options For Maize-Cowpea Production In Semi-Arid Eastern Kenya; The potential of Ipomoea stenosiphon as a soil fertility ameliorant in the semi-arid tropics; Effect of Aluminium concentration and liming acid soils on the growth of selected maize cultivars grown on sandy soils in Southern Africa; The role of Biological Technologies in Land Quality Management: Drivers for Farmer’s Adoption in the Central Highlands of Kenya; Biophysical characterization of Oasis soils for efficient use of external inputs in Marsabit District: Their potentials and limitations; Multi-functional properties of mycorrhizal fungi for crop production: The case study of banana development and drought tolerance; Effect of Phosphorus Sources and Rates on Sugarcane Yield and Quality in Kibos, Nyando Sugar Zone; Natural and antropic determinants of soil carbon stocks in two agro-ecosystems in Burkina Faso; Integrated Soil Fertility Management Involving Promiscuous Dual-purpose Soybean and Upland NERICA Enhanced Rice Productivity in the Savannas; Nitrogen Use in Maize (Zea Mays) –Pigeon pea (Cajanus cajans) Intercrop in Semi- arid Conditions of Kenya; Nitrogen and phosphorus capture and recovery efficiencies, and crop responses to a range of soil fertility management strategies in sub-Saharan Africa; Greenhouse Evaluation Of Agronomic Effectiveness Of Unacidulated And Partially Acidulated Phosphate Rock From Kodjari And The Effect Of Mixed Crop On Plant P Nutrition; Effect Of Continuous Mineral And Organic Fertilizers Inputs And Plowing On Groundnut Yield And Soil Fertility In A Groundnut – Sorghum Rotation In Central Burkina Faso; Soil Inorganic N and N uptake by maize following application of legumes biomass, tithonia and manure, and inorganic fertilizer in central Kenya; Changes in δ15N and N nutrition in nodulated cowpea (Vigna unguiculata L. Walp.) and maize (Zea mays L.) grown in mixed culture with exogenous P supply; Cation flux in incubated plant residues and its effect on pH and plant residue alkalinity; Agronomic efficiency of human stool and urine on the production of maize and egg plant in Burkina Faso; Potential for Reuse of Human Urine in Peri-Urban Farming; Towards sustainable land use in Vertisols in Kenya: challenges and opportunities; Potential Nitrogen Contribution of Climbing Bean to Subsequent Maize Crop in Rotation in South Kivu Province of Democratic Republic of Congo; Investigation on the Germination of Zanthoxylum Gilletii Seeds (De Wild) Waterm (East African Satinwood); Combining ability for Grain Yield of Imidazolinone Resistant-maize inbred lines under Striga (Striga hermonthica) infestation; Identification of plant genetic resources with high potential contribution to the soil fertility enhancement in the Sahel with special interest in fallow vegetation; Within-farm variability in soil fertility management in smallholder farms of Kirege location, Central Highlands of Kenya; Residual Effects of Applied Phosphorus Fertilizer on Maize Grain Yield and Phosphorus Recovery from a Long-Term Trial in Western Kenya; Potential of combined effect of organic and inorganic fertilisers on crop productivity; Phenotypic Characterization Of Local Maize Landraces For Drought Tolerance In Kenya; Targeting resources within diverse, heterogeneous and dynamic farming systems: towards a ‘uniquely African green revolution; Exploring crop yield benefits of integrated water and nutrient management technologies in the Desert Margins of Africa: Experiences from semi-arid Zimbabwe; Population dynamics of mixed indigenous legume fallows and influence on subsequent maize following mineral P application in smallholder farming systems of Zimbabwe; Formulating crop management options for Africa’s drought-prone regions: Taking account of rainfall risk using modeling; Residue quality and N fertilizer do not influence aggregate stabilization of C and N in two tropical soils with contrasting texture; Interaction between Resource Quality, Aggregate Turnover, Carbon and Nitrogen Cycling in the Central Highlands of Kenya; Performances of Cotton-Maize Rotation system as Affected by Ploughing Frequency and Soil Fertility Management in Burkina Faso; Developing Standard Protocols for Soil Quality Monitoring and Assessment; Increasing productivity through maize-legume intercropping in Central Kenya; Contributions of cowpea and fallow to soil fertility improvement in the guinea savannah of West Africa.